Okey Geffin, the Transvaal star who set a World test match record with five penalties from five attempts and later scored 35 of 47 points to set another World test match record, honed his rugby talents while a World War II prisoner of war! Captured at Tobruk during the North African campaign, Sergeant Geffin would spend three years as a POW in Italy and Germany. He escaped in Italy, only to be recaptured and sent to Germany, where he again escaped and was caught twice. Geffin was incarcerated in the German camp with 1928 rugby Springbok Bill Payn. 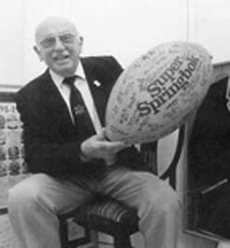 Shortly after his release at war’s end in 1945, Geffin was selected to play for Transvaal, for whom he would compete for seven years, including winning two Currie Cup Finals. Transvaal lost the first Cup Final by two points. But Okey was Transvaal’s placekicker for the 1950 Currie Cup, making 12 of 22 points scored in the victory. penalties from five attempts. (South Africa, losing the match 0–11, came back to win 15–11). In a four-match Test against the All-Blacks of New Zealand— all of them victorious for South Africa—Geffin scored 35 of his team’s 47 points—another World record. Geffin’s handprints and boot prints are displayed in the New Zealand National Rugby Museum in tribute to his 1949 feat. Other South African international matches in which he competed included Tests against Great Britain, Wales, Ireland, Scotland, and France. Upon retiring from rugby, Geffin continued as a prominent South African sportsman, first as a three-handicap golfer and then as a Bowls national champion. At the 1969 World Maccabiah Games in Israel, Okey led South Africa to a gold medal sweep of the four Bowls events.